Skip to License and download. The "KC Groups Management" plugin is unique for s2Members and WordPress at all. Imagine you want to allow access to some s2Member level to a company. Not to "a company as member", but to whole "company" as "several members". Several people, with several accounts, passwords, profiles, but all have same access rights (Pro version have much more options). But one of them pays membership fee to you for himself and all the rest from same company. Obvious way is to set all the members to same s2M level. But only one make payment, so others must set/demote manually... Spends centuries. The "KC Groups Management" plugin create and handle Groups of WP Members under s2Member. One "master" member can have a number of "submembers" (you set that number), which share the subscription privileges of his "master". With Basic version all the members in one group must have same domain name for his emails. With Pro version you have 3 more options. With "KC Groups Management" plugin you have to care about one member only - the master of group. Plugin cares about all the rest, saving you lot of chores. The plugin creates and handles groups of member. You set the "max possible members" numbers for each existing level. Then, the one who make payment is the new Master. Master in his "My account" (provided by s2Member under "Member Profile Modifications") can add, change and delete submembers. Sure, only with same email domain as himself - the company's domain (Pro version have much more options). When membership of the Master expires (or s2Member demotes the Master because of cancellation, refund etc), all the group is demoted, so membership expires for all. Admin can do same in "User account" - to create Masters, to add, change and delete submembers. Admin also can handle the submember's account as usual. Plugin removes "role" dropdown for submembers (as their level is always same as for their master). Possible scenario (initial manual handling): Create/choose Master, set his access level etc. Then add submembers as "subscribers" (if they are new members). Then attach submembers to his Master. Plugin also adds a new column in"Users" admin page - "N# of submembers". For Masters will show correct number of submembers. For submembers will show zero. Please check comparison table of both versions. When ready, you should go to admin page (Dashboard -> Settings -> KC Groups Management) to set the max allowed submembers to each level. Also the behaviour when Master is deleted. Pro version have more settings possible, please read more in Pro section bellow. First set max number of allowed submembers for each level. Also set what plugin must do with "orphans" (submembers, which master was deleted). See screenshots 1 and 2 bellow. You maybe do this in installation already. Ready, now all members must be created. Means, all the submembers and his master must be members in your site already. Then master do purchase. Actually, the purchase do him master. 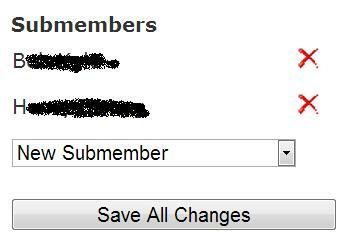 Now he can add submembers in his account, there will be a dropdown list with possible submembers (screenshot 4). Also admin can add submembers to a master, manually, in "Edit user" page. This is not required, because masters can do that himself. But allows you to fix mistakes etc. Again, will be a list with possible submembers (screenshot 3) for the exactly master. If all the positions in the group are full, will not be such list, until master (or admin) deletes some existing submembers. Also if no possible submembers in the site, will not be a list too. is not submember to another master. Submembers can see who is his master (screenshot 5) in his profile. Each submember have only one master. No way a member to be in two groups simultaneously. The master (or the admin) can add/delete/change submember when he wants. Who is not submember, becomes "subscriber" (Level0). Who is submember, have all the rights of his master, except that can not manage group's submembers and have no his own submembers (Pro version have much more options). So if master changes his level, all the group changes the level, and anyone have same rights. If master is demoted to "free", all the group becomes "free". When, later, master pay for some level again, all the group follows him, again. It is possible two and more masters to be on different levels, and each group of them will have the rights for exactly level of his master. So submembers of different groups will have different levels (Pro version have much more options). Generally, here is only one rule: All submembers have all the rights of his master (and once again, Pro version have much more options). Exception: Both masters and submembers can have ccaps, allowing him something else. Ccaps are "private", only level is shared. Q: Why my custom registration/profile fields don't recognize future submembers to his master? A: This is a strange case of a misleading in s2Member® and limitations in my plugin. How to fix: "Unique Field ID" of custom fields in s2Member® must be all low letters and "_" char only, like "my_custom_field". Must NOT be "my-custom-field" or "MyCustomField". That is all the magic. Q: I'm a little hesitant due to cost, especially since I may need the PRO version to accommodate for multiple email domains. I wish I could do a trial prior to purchase? if possible? If not, would a refund be an option if it doesn't work for me after a week or so? A: Not a problem to refund you within 2 weeks after purchase, if you are not happy. But I think you will prefer me to set it (or fix it, if needs) instead. Me too - plugin adds features, which is good for everyone. Ask me, I will answer any other questions. With Pro version you have more features. First of all, most of the settings are "per level", so you can tune the plugin very fine to achieve your needs. With "Masters can add submembers" (in "Submember's criteria" column) we unlock one of limitations in Basic version. There member can add a submember with his email domain only. Means, the whole group must have same email domains, like "company.com". Now you have several chooses. First option repeats same solution as Basic version - strictly same domain. Second option gives you (the Admin) ability to set a list of allowed domains to each master. Master's domain is allowed only if it stay in the list. This way you can even "strictly exclude" master's domain, if this is what you need. Next option allows both domains from the list and master's one. So if you set a list for one master, but not set for second one, first one can add submembers with domains from the list plus his own domain, but second can operate in his own domain only. And the last option is to remove the "email domain" restriction at all. You can set a second restriction: by s2Member custom field. Means, all the members in the group of each master must have same "City" value, as example. Different masters can have different cities, but their groups will have only his master's city. Also you see in the screenshot, that with the Pro version a master can have submembers in other level. Your masters at Gold level (per screenshot settings) will have 10 submembers at Bronze level. Moreover, the Bronze members (who may or may not be submembers of a Gold master) will have 5 submembers. So it is possible to have "domino effect" - when a Gold member expires, all his Bronze submembers expire too, and his (Bronze again) submembers (sub-submembers to the Gold member) expire too, so the whole "tree of members" will go to the free level. And backward - when the Gold master upgrades his membership, all the submembers and sub-sub-...-members are set to his levels again. That's the real power of this plugin. Note, that this comes with a price - free level can not have submembers. Also you must not do "dead loop" of sub-membership. Be careful. Newest feature is the "User interface shortcode" ("kcgm_ui"). If you need to allow your members to set his groups on some page/post, place that shortcode there. This allows same functionality like on the profile page. Another good feature: "Submember's email notification". When submember is added to a group, he will receive a mail (if you choose to set that). The text of this email is same for all, but can be customized with member's info, almost all possible fields are allowed. There stay a help text, please read. This is not the usual WP "welcome email", this is plugin's own message and it's very flexible. This way all members will not see WP's standard backend, but s2Member's protected profile page. Much safer for your site. Sure, same can do in Basic plugin too. See the comparison table, please. Short explanation of license: Perpetual License with 12 Months Support. You buy "allowed domains" number (not installations, on one domain you can have several sites), with one year updates, bugfixes, training, installation help. When the year passes your plugin will works, if no significant changes in WordPress® and s2Member®. Also you get lifetime discount for any other products of mine. Additionally, we will set discount for all new features you may need. Also I would like to share my revenue with you. Welcome to my Affiliate program. Please read full explanation of license. 1 150 USD You must log in or create account to purchase this product. 1 300 USD You must log in or create account to purchase this product. This entry was posted in WordPress plugins, WP+s2M plugins and tagged group, group membership, group of members, groups, integrate, integration, member, member's group, member's groups, members, members info, membership, membership level, s2m, s2member, share, share level, share membership, share membership level, share priviledges, synchronization, synchronize, tool. Bookmark the permalink.